CHECKLISTS:The Maine Bird Records Committee recognizes 429 positively identified birds in the state, but you won't see that many. Grab the full state list, or a pocket list, or both. 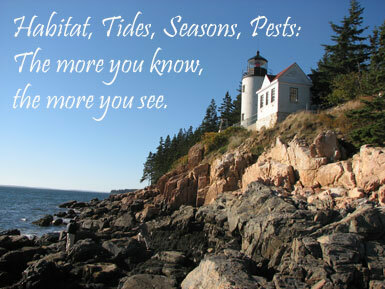 DIVERSE HABITATS: Maine is a diverse state - dead center in the temperate zone. The 45th parallel runs through the heart of the state. Northern deciduous forests prevail in the southern and central interior parts of the state. Boreal forests begin to take over in Baxter State Park, and at the higher elevations of the western mountains. Boreal forests also exist in the cedar swamps of the north woods and downeast in Washington County, as well as most of the wooded offshore islands. These forest types mix at transition points and birds of the different habitats can be found close together. TIDES: Maine has some of the highest tides in the world. Tides are critical to certain birding opportunities, especially for shorebirds. At high tide, shorebirds go to roost. As tides fall, the birds flock to "first mud" and begin feeding voraciously. Often, this is when they are most concentrated for viewing. As tides continue to fall, the peeps disperse across the wide mud flats. Viewing becomes more distant and difficult. The rising tide pushes the birds back to "last mud" and the cycle repeats. SEASONS: Maine is blessed with four season birding, each season with a different set of surprises and challenges. The busiest birding season begins in April, when blackbirds, waterfowl, sparrows, and the first warblers return. Expect mud and standing water. Migrants arrive in Southern Maine and Portland about a week ahead of Acadia and Bangor, which in turn are nearly a week ahead of the Katahdin and Aroostook regions. PESTS: Black flies and mosquitoes are the top two complaints among Maine birders, but both are controllable problems. Everybody in the world knows about mosquitoes, but Maine's Black Fly comes as a sorry surprise to some.